This is WeWork, the shared office outfit that has grown from a single building in Manhattan in 2010 into a hipster hot-desking behemoth with more than 170 sites in 19 countries and 58 cities, from Beijing to Bogotá. I have taken almost no notice of its rise until now, except for its extraordinary $20 billion valuation – and the growing band of sceptics who think that figure makes no sense. They may be right. Documents leaked to Bloomberg last year suggest the privately held company slashed its profit forecasts for 2016 from $65 million to $14 million. Yet in the past few weeks, as I have bumped into more and more people who have moved into one of its offices, I have decided that WeWork is doing something interesting to modern corporate life. The first hint came from a friend at an international nonprofit group in Washington who found herself in a WeWork office with a hairdresser and meditation instructor on tap, along with the free roasted coffee and an open-door policy for dogs that are standard for the company. She was as enthusiastic as the boss of a London tech start-up with staff in Buenos Aires, where there was a waiting list to get even a hot desk at WeWork – a haven of transparent pricing and instant wifi in a city used to rising rents and power blackouts. I am all in favour of anything that makes office life less sterile and more human, especially if it is also more functional. But it was the people from the much larger companies starting to use WeWork who really made me think, such as Jonathan Kini, chief executive of the retail wing of Drax, owner of the UK’s biggest power station. Drax has a perfectly good corporate office near the Bank of England in the City of London. But when Mr Kini’s division needed more space, he nabbed a private office in the WeWork building up the road. Having had a snoop around it with one of the older Drax workers, who admitted he often felt as if he were the only one there wearing socks, I could see the attraction. It was not just the craft beer bars and designer sofas scattered around the bare wood floors. Nor the rows of private phone booths that I would not mind in my own open-plan office. It was the video screens on the walls pitching the wares of other tenants. Drax’s staff may not need to know about the digital marketing start-ups who were advertising on those screens the day I visited. But if they did, they had only to pad around the corner to find them. So can employees from HSBC’s small businesses division who moved into a nearby London WeWork office nearly a year ago. “That’s something you don’t get in a normal corporate office,” said their boss, Richard Bearman. He likes the way the village-like atmosphere means people from younger companies in the building can knock on HSBC’s glass door for a chat. He thinks the bank’s staff are trusted more by potentially important new customers than if they were sitting behind a computer in a typical branch office. It also helps the bank to know how newer outfits are working. In an age of relentless disruption, I can see the appeal for older companies of being closer to start-ups doing the disrupting, and vice versa. Places like WeWork are obviously not for everyone. I know a lot of people who would be appalled at the idea of working in a building full of strangers from other businesses, especially if they had to dodge a dog on the way to their desk. Personally, I am very happy to work in a place that keeps the outside world at bay, though I would be even happier if it had dogs. 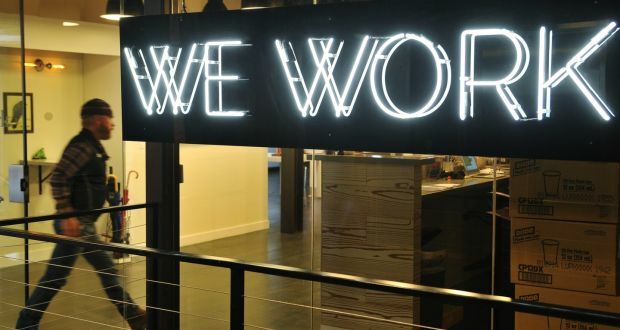 Still, I am not surprised that WeWork says companies with more than 1,000 workers are one of its fastest-growing segments and now account for more than 20 per cent of its membership. Previously published in The Irish Times.